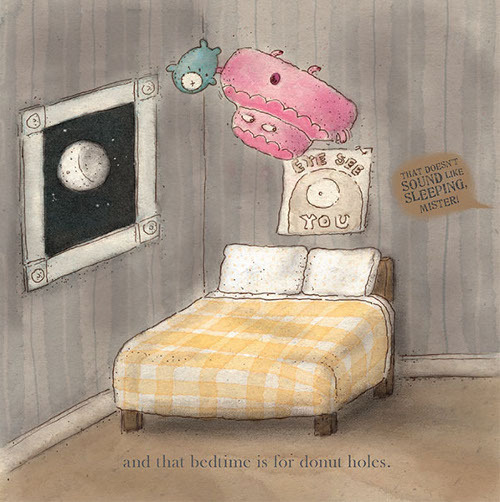 The best picture-book debut of 2015 is Rowboat Watkins’ Rude Cakes. Yes, I know it’s only May 7th. And I don’t claim to have read every picture book published thus far. But it’s going to be hard to top this one. The notion of an ill-mannered, sentient cake is funny on its own. But Watkins goes further. 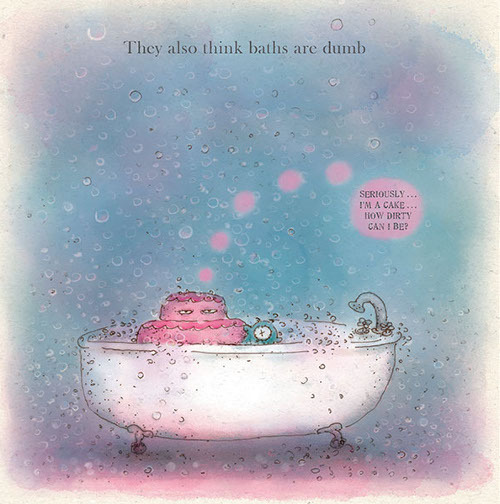 In the first half of the book, the titular character — a pink, bratty cake — refuses to listen to its parents or to wait in line, bullies a cupcake and a marshmallow on a playground, and glowers in the sudsy water of the bathtub before reluctantly going to bed. So far, it’s a comic didactic tale. Then, enter a Giant Cyclops. Really. The cake is jumping up and down on the bed, playing with the little stuffed toy blue Cyclops that it stole from the cupcake, when — through the open window — a giant blue Cyclops hand enters, plucking the cake from its bedroom, lifting it up towards its toothy open mouth… only to wear the cake on its head. As Watkins’ narrator explains, giant Cyclopses “LOVE to wear jaunty little hats.” And this Cyclops thinks that the cake is a hat. Watkins’ doodley, expressive line and soft watercolors provide his cakes and Cyclopes with the necessary solidity and silliness. Think of James Marshall’s hippo duo, George and Martha. Or of Laurie Keller’s misunderstood pastry, Arnie the Donut. As in any book by Marshall or Keller, Watkins’ characters have a real presence, and joy. Lots of joy. When I read the book, it feels like Rowboat Watkins is standing just behind the illustrations (where I can’t see him), and he’s smiling happily to himself. Or maybe he’s smiling at the fact that I am also smiling while I read his book. He has imagined an oddly coherent universe populated by polite Giant Cyclopses, one rude cake, two beleaguered playmates (the cupcake and the marshmallow), and the rude cake’s exasperated parents (also cakes). In other words, Watkins understands Dr. Seuss’s principle of “logical nonsense”: as Seuss put it, “If I start with a two-headed animal I must never waver from that concept. There must be two hats in the closet, two toothbrushes in the bathroom and two sets of spectacles on the night table. Then my readers will accept the poor fellow without hesitation and so will I.” So, for instance, the Cyclops seems to come out of nowhere until you remember that the chocolate cupcake had a toy Cyclops, and the rude cake had a Cyclops poster over its bed. Later in the book, the child characters (rude cake, cupcake, marshmallow) frolic with Cyclopean balloons — each balloon has a giant eye. Theirs is a world in which Giant Cyclopses not only exist, but also are — in toy form — a cherished part of childhood. And why not? After all, we live in a world where we’d think twice about cuddling real live bears, but quite happily give children teddy bears to cuddle. In Watkins’ world, Giant Cyclopses are similar. By the book’s end, our bratty cake learns some manners. 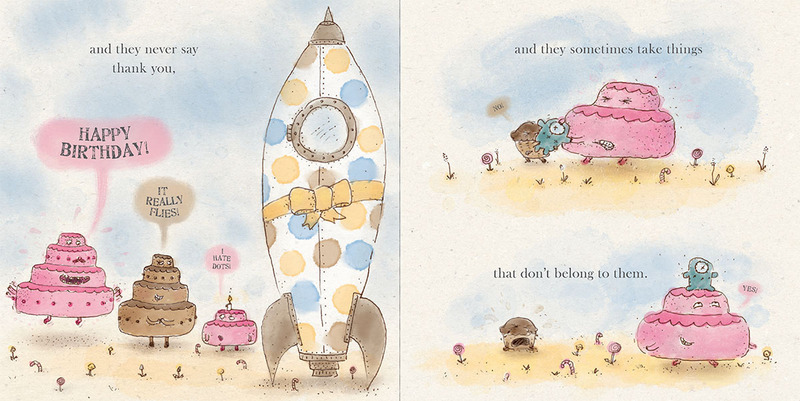 But, as in Marshall’s George and Martha or Arnold Lobel’s Frog and Toad books, Rude Cakes sublimates its didactic impulse, expressing its lesson via the pleasures of story. 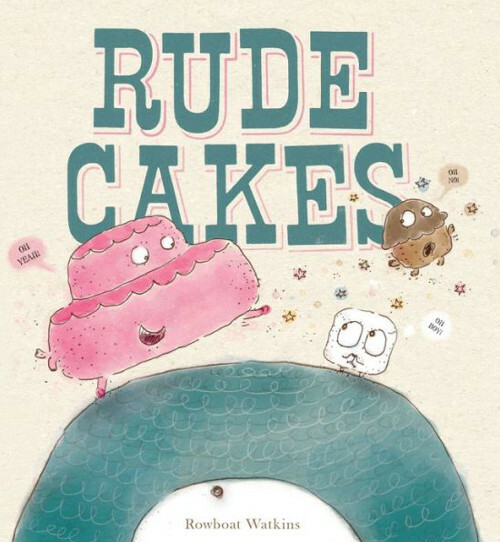 Watkins’ book has a moral, but what makes Rude Cakes work is its playful, loopy storytelling. In his baked goods and Cyclopses, Watkins offers an unusual but perfect metaphor for how larger forces can shake an obnoxious child out of its selfish egoism, revealing the kinder, gentle person within. Rowboat Watkins is an original, singular talent. I can’t wait to see what he comes up with next. P.S. If you’ve not read Jules Danielson’s magnificent interview with Rowboat Watkins, then get on over to Seven Impossible Things Before Breakfast and read it now. Then, read it again. Mr. Watkins has thought very carefully about picture books. You could learn a lot from him. This looks delightful! And I love your review title. It is delightful. It’s definitely going into Emily’s Library!